Ah, those hazy summer days. Sitting on my porch rocking chair with my bare foot dangling lazily over the arm rest whilst I rest peacefully over the other one. So relaxed my eyelids hover within centimeters of each other.. If only that were true. More likely scenario, I'm grabbing a few pages here and there while stuffing my face with Doritos and rubbing the skin off my sunburned nose while absentmindedly sort of watching my kids play/pretend not to drown in the neighborhood pool. But alas, sigh, it's still the perfect time to read me some Heyer. The funniest one I've read of her's so far, this one did not disappoint. Taking place when England was at war with the soon to be United States, all the classic Heyer is included - kidnapping, mistaken identity, more kissing than usual, her favorite word, odious, among others - she has the knack for entering just the right word at just the right time. My heart swooned as always at her dashing, unaffected hero, and I laughed out loud more than once at a group of bumbling goofballs who in the end are at least as funny as Bottom and his acting troupe from A Midsummer Night's Dream, and that's saying something.. Yet again, I can't help but wonder: why aren't any of her books made into movies?? I'd be first in line if they were. 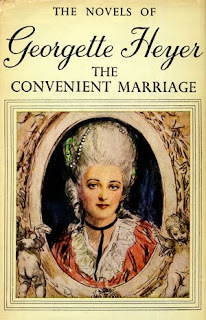 I haven't read Georgette Heyer yet and it sounds like I should start. I am curious about her books. If her books are made into movies, I personally hope that Masterpiece Classics/BBC makes them. They'd turn out brilliantly!